Users can report marine debris, creosote, and king tides on the MyCoast app to help public lands officials prioritize Puget Sound cleanup efforts. SEATTLE — You can now help keep Puget Sound clean for wildlife and beach-lovers, thanks to a mobile app launched Wednesday by the Washington State Department of Natural Resources. 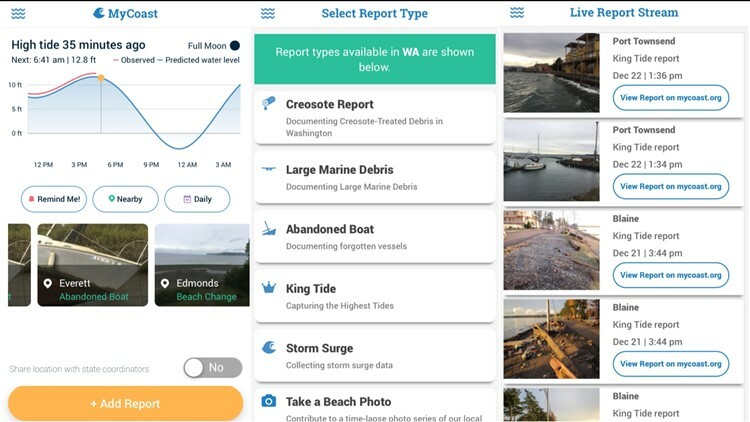 Through the MyCoast Washington app, people can submit reports and photographs of large marine debris, creosote, abandoned boats, storm surge, and king tides. The reports will help the department prioritize cleanup efforts and track coastline changes. Creosote-treated materials are especially of concern to the department, because chemicals from that debris can leach into marine sediment and cause toxic conditions for organisms that live in the area. When users see debris that shouldn’t be on Washington’s beaches, they can log on to the app and submit geo-located photos that go to DNR’s Marine Debris Removal Program. There’s only three full-time employees running the cleanup work, but the public-generated database helps staff decide what need to be taken care of first. Washington is one of nine states that has the MyCoast app, and it’s the only one on the west coast. MyCoast can be downloaded for iPhone or Android.